Eliminate nasty habits, with subliminal messages! Cut unwanted behaviors out of your life and regain control of your body. View More. Do you wish you could kick your nail-biting habit? Want a fast and effective method that's guaranteed to work? Biting your nails is unhealthy and uncouth. It makes you look a bit foolish, as if you haven't eaten enough. But nail-biting is often a sign of nervousness, a physical indication that you're feeling stressed and uptight. With the Stop Nail Biting subliminal session, you'll find the strength to resist biting your nails for good! As you listen, thousands of powerful positive affirmations will rewire your brain, helping you overcome your urge to bite your nails. You'll start to treat your hands and fingers better, keeping them away from your mouth. You'll become more relaxed and find other ways to relieve any stress, using your nails and teeth in more natural and appropriate ways. Eliminate your nail-biting habit for good! 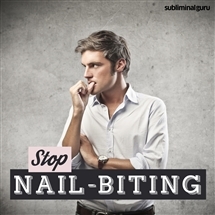 Download the Stop Nail Biting subliminal audio now to enjoy naturally perfect nails for months and years to come. I can easily overcome my nail biting habit. I can avoid biting my nails. I let my nails grow naturally. I can control my body's impulses. I keep my nails away from my mouth. I am aware of what my hands and teeth are doing at all times. I take good care of my nails and fingers. My nails get stronger every day. People admire my beautiful nails. I clip my nails instead of biting them. I love the way my nails look. My nails are healthy and strong.